Tonight I have been eating rubies. What lovely (fabulous) pictures! Is it any wonder that Solomon decorated the temple with pomegranates? I love the last picture, it really shows the beauty and color of the seeds! I also love the second-to-the-last picture. It really shows the texture(!). Don't you think? Rubies is such an appropriate description! I bask in their marvelous beauty. And the skill of your photography. I agree! They're just so beautiful. I love looking at 'em. Well, naturally. They're delicious, no? I must say, I've noticed you like the word "NO! ", no? Sorry Miss Fingers, I don't have an "understatement of the year" ribbon for you. btw, go to my blog, if you would, and vote on my poll!!! So How many seeds are in a pom? Is it true? I've heard. They all have the same number of seeds. Feel like a counting party. See. Math IS fun! 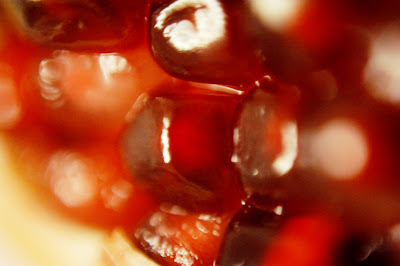 Pomegranates are so cool. Great captures of color and texture. Things that make me smile + 3 Quick DIYs! The first blog post! Dun-dun-DUNNN!! !